JAMIE PEYTON SNAPPED AN INSTAGRAM PHOTO of herself while aboard an airplane headed to England in May. 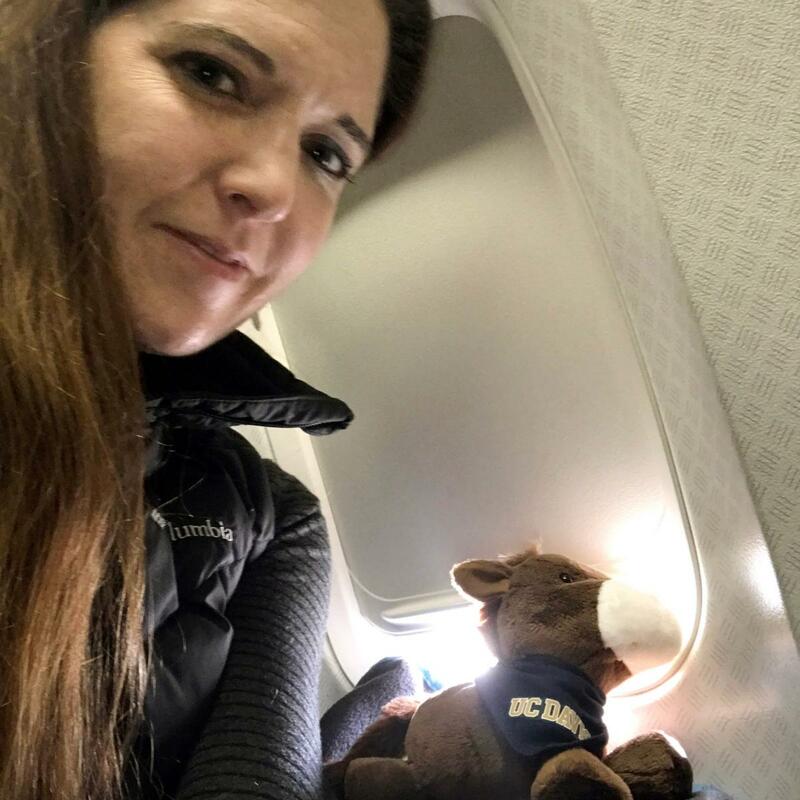 In her hand, she held a tiny, stuffed horse wearing a University of California, Davis, T-shirt. It was the perfect photo for the mission. The UC Davis integrative medicine veterinarian had been called to save a real horse. An 18-month-old gypsy cob pony had been found abandoned and starving in a field in Yorkshire. That wasn’t the worst of it. Her face was horrifically scarred with oozing wounds from extensive third-degree chemical burns. The injuries left her unable to open her eyes. A good Samaritan had brought the pony to local veterinarians who had heard about Peyton’s successful use of tilapia fish skins to heal a mountain lion and two black bears burned during the California wildfires last fall. Veterinarians in Yorkshire thought the novel treatment might work on the pony. Within a few days, Peyton was on a plane to help. She carried with her a cooler full of sterilized tilapia skins that would eventually act as a healing biological bandage for the pony. The torture and neglect that the pony had suffered was just horrid. She was skinny, lice-infested, had overgrown hooves, bad teeth, and a bleeding face. The overgrown hooves prompted vet technicians to name her Cinderella or “Cinders” for short, as she would soon get new shoes and become more like a princess. “She didn’t want anyone touching her face,” Peyton said. She and the Yorkshire team went to work cleaning the burns, removing dead tissue and applying ointments to ease the pain. Treatments such as cold laser therapy and pulsed electromagnetic field therapy were also applied. Peyton originally came up with the idea of using tilapia skins from reading about a group of doctors in Brazil that had used them to successfully treat burns on people. Brazil and many other developing countries lack human skin and artificial alternatives that are widely available in the United States to treat burn wounds. But tilapia is a farmed fish that is abundant. Their skins are usually thrown away. Tilapia skin, like human skin, can transfer collagen, a healing protein. It can reduce pain. Peyton and the team went to work on Cinders’ burned face, suturing tilapia skins from the top of her forehead down to her mouth. “We created for her what we called ‘a little fish face,’” Peyton said. Within an hour of waking up from the anesthesia, Cinders was eating again. By the next morning, she let veterinarians touch her face. Wounds as extensive as Cinders’ usually take six months to heal, but two weeks after the fish skins were first applied, about 80 percent of the skin had grown back on her face. Cinders was the first horse to be treated with tilapia skins for burn wounds, Peyton said, but the first animal test case came in October during California’s largest recorded wildfire at the time, the Thomas Fire in Ventura and Santa Barbara counties. The California Department of Fish and Wildlife rescued two adult female black bears and a 5-month-old mountain lion with third-degree burns on their paws -- a death sentence for big predators that must cover a lot of terrain to stay fed. One of the bears was found sitting with her paws in a stream of water, unable to move from the pain. Deana Clifford, the wildlife agency’s senior veterinarian and an assistant clinical professor at the UC Davis School of Veterinary Medicine, treated the burns and enlisted Peyton to soothe the animals’ pain. Peyton said the younger bear inspired her to think of an outside-the-box solution. The tilapia skins were born out of sheer necessity, with veterinarians at the state wildlife investigations laboratory in Rancho Cordova working against the clock. They couldn’t risk the bears adjusting to captivity. Frequent bandage changes on wild animals would be too difficult. The team also had trouble getting the animals to swallow pain pills. Complicating the situation even more, they soon found out that one of the bears was pregnant. That’s when Peyton decided to try tilapia skins for the first time. She bought the tilapia at a local fish market and sterilized the skins, which removed any fish smell that could tempt the animals to eat the biological bandages. Peyton sutured the tilapia skins to the bears’ paws. After the younger bear woke up, one of the first things she did was sit up with her paws on the ground. “She was more mobile, which in my mind is a huge success for pain control,” said Peyton. Just like Cinders, new skin had grown back on the animals’ paw pads in a matter of weeks. Because the mountain lion cub was so young, biologists believe he would not survive in the wild. He’s now cared for at the Sonoma County Wildlife Rescue in Petaluma. Wildfire destroyed both bears’ original habitat, so state wildlife officers created separate dens for them in the Los Padres National Forest. Each still wears a satellite collar. 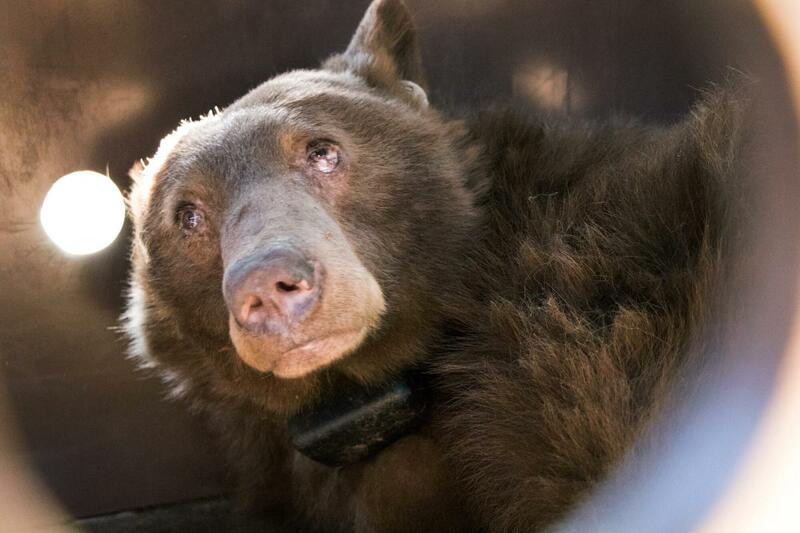 Every few days, the collars register “pings,” indicating normal behavior and movement. Biologists have tracked them traveling miles from their dens, indicating that their paws must be healing well. Will fish skins become standard care? The implications for treating burns with tilapia skins extend beyond the veterinary field. The World Health Organization calls burns a global public health problem, accounting for 180,000 deaths a year. While burns are treatable, advances in treatment and care have been applied mostly in higher income countries where people have access to expensive dermal substitutes. Peyton believes the low-cost and widespread availability of tilapia skins makes it a game-changer for treating burns, whether animal or human.